I thought the book was a real piece of special pleading, Meaghan. The fact remains that wherever Mary Ann Cotton went, people died particularly her own children and husbands. I recently read a new book about Mary Ann Cotton, “Mary Ann Cotton: Dark Angel” by Martin Connolly. Connolly makes a good case that A) She did not get a fair trial and B) There is a significant chance that she was not a serial killer and she may have never murdered anyone at all. Her stepson whom she was convicted of killing did die of arsenic poisoning but there were a number of ways it could have been accidentally introduced into his system, as arsenic was pretty much everywhere in those days. 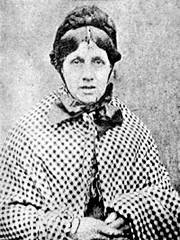 Mary Ann Cotton may have just been a very unlucky woman.